The resources posted on the Web site of the National 911 Education Coalition were not created by the Coalition and are not property of the Coalition. They are being shared in the interest of information exchange. The opinions, findings, and conclusions expressed in these publication and on these Web sites are those of the authors and not necessarily those of the Coalition. The National 911 Education Coalition assumes no liability for their contents or use thereof. If trade names, manufacturers’ names, or specific products are mentioned, it is because they are considered essential to the object of the publication and should not be construed as an endorsement. The National 911 Education Coalition does not endorse products, services or organizations. 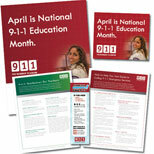 Looking for free 9-1-1 posters, graphics, educational handouts and other useful materials? The National Association of State 911 Administrators Information provided as a public service.